Preparation and Characterization of Polymer Composites, Nanocomposites and Microcellular Composites. Nga Thi To Dang, S. P. Mahapatra, V. Sridhar, Jin Kuk Kim, K. J. Kim and H. Kwak, Dielectric properties of nanotube reinforced butyl elastomer composites, Journal of Applied Polymer Sciences, 113(3), 1690-1700, August 2009. DOI: 10.1002/app.30166 http://onlinelibrary.wiley.com/doi/10.1002/app.30166/abstract. V. Sridhar, Deng Xu, Thanh Tu Pham, S. P. Mahapatra, Jin Kuk Kim, Dielectric and Dynamic Mechanical Relaxation Behavior of Exfoliated Nano Graphite Reinforced Flouroelastomer Composites, Polymer Composites, 30(3), 334-342, 2009. http://onlinelibrary.wiley.com/doi/10.1002/pc.20559/abstract. Deng Xu, V. Sridhar, S. P. Mahapatra and Jin Kuk, Kim, Dielectric properties of exfoliated graphite reinforced flouroelastomer composites, Journal of Applied Polymer Sciences, 111(3), 1358-1368, 2009. http://onlinelibrary.wiley.com/doi/10.1002/app.29183/abstract. S. P. Mahapatra, V. Sridhar, R. N. P. Chowdhury and D. K. Tripathy, AC conductivity and positive temperature coefficient effect in microcellular EPDM vulcanizates; Polymer Composites, 29(10), 1125-1136, 2008. http://onlinelibrary.wiley.com/doi/10.1002/pc.20383/abstract. S. P. Mahapatra (Corresponding Author), V. Sridhar, D. K. Tripathy, Jin Kuk Kim, H. Kwak (Corresponding Author), Dynamic Mechanical and Dielectric Relaxation Characteristics of microcellular EPDM Rubber Composites, Polymers for Advance Technology, 19(9), 1311-1322, 2008. http://onlinelibrary.wiley.com/doi/10.1002/pat.1133/abstract. S. P. Mahapatra and D. K. Tripathy, Rheological behavior of microcellular oil extended EPDM rubber compound: Effect of blowing agent, curing agent and conductive carbon black filler; Journal of Applied Polymer Sciences, 109(2), 1022-1030, 2008. http://onlinelibrary.wiley.com/doi/10.1002/app.28085/abstract. S. P. Mahapatra, V. Sridhar, and D. K. Tripathy, Impedance Analysis and Electromagnetic Interference Shielding Effectiveness of Conductive Carbon Black Reinforced microcellular EPDM Rubber vulcanizates; Polymer Composites, 29(5), 465-472, 2008. http://onlinelibrary.wiley.com/doi/10.1002/pc.20421/abstract. S. P. Mahapatra, V. Sridhar, R. N. P. Chowdhury and D. K. Tripathy, Dielectric relaxation of Ensaco 350G reinforced microcellular EPDM vulcanizates, Polymer Composites, 28(5), 657-666, 2007. http://onlinelibrary.wiley.com/doi/10.1002/pc.20325/abstract. S. P. Mahapatra, V. Sridhar and D. K. Tripathy, Dielectric studies of conductive carbon black reinforced microcellular EPDM vulcanizates; Journal of Applied Polymer Sciences, 106(1), 192-204, 2007. http://onlinelibrary.wiley.com/doi/10.1002/app.25509/abstract. S. P. Mahapatra, V. Sridhar, R. N. P. Chowdhury and D. K. Tripathy, Relaxation behavior of conductive carbon black reinforced EPDM microcellular vulcanizates; Polymer Engineering and science, 47(7), 984-995, 2007. http://onlinelibrary.wiley.com/doi/10.1002/pen.20715/abstract. S. P. Mahapatra and D. K. Tripathy, Dynamic mechanical properties of conductive carbon black reinforced closed cell microcellular oil extended EPDM rubber vulcanizates: effect of blowing agent, temperature, frequency and strain; Journal of Applied Polymer Sciences, 102(2), 1600-1608, 2006. http://onlinelibrary.wiley.com/doi/10.1002/app.23927/abstract. S. P. Mahapatra and D. K. Tripathy, Compressive deformation and energy absorption characteristics of conductive carbon black reinforced microcellular EPDM vulcanizates; Cellular Polymers, 24(4), 209-222, 2005. http://cat.inist.fr/?aModele=afficheN&cpsidt=17033353. Janita Saji and S. P. Mahapatra, Morphology, Mechanical and Dynamic Mechanical Studies of Silicon Elastomer Nanocomposites, Journal of Basic and Applied Engineering Research, 1(9), October 2014, 33-38. (ISSN: 2350-0255). S. K. Tiwari and S. P. Mahapatra (Corresponding Author), Relaxation behavior of nano-graphite reinforced chlorobutyl elastomer nanocomposites, International Conference on Advancements in Polymeric Materials APM 2014, Feb. 14-16, Cipet Bhubaneswar, India. Janita Saji, A. Khare, S. P. Mahapatra (Corresponding Author), Morphology, mechanical, dynamic mechanical and percolation studies of silicon elastomer nanocomposites, International Conference on Advancements in Polymeric Materials APM 2014, Feb. 14-16, Cipet Bhubaneswar, India. S. K. Tiwari, B. P. Sahoo, S. P. Mahapatra (Corresponding Author), Physico-Mechanical, Dynamic Mechanical and Bound Rubber Properties of Nanographite Reinforced Chlorobutyl Nanocomposites, International Conference on Advances in Chemical Engineering, ICACE-2013, April 5th – 6th 2013, NIT Raipur, India. J. Saji, A. Khare, S. P. Mahapatra (Corresponding Author), Studies on Silicon Elastomer Nanocomposites: AC Conductivity and Positive Temperature Coefficient, International Conference on Advances in Chemical Engineering, ICACE-2013, April 5th – 6th 2013, NIT Raipur, India. S. K. Tiwari, B. P. Sahoo, S. P. Mahapatra (Corresponding Author), Morphology and Physico-mechanical, Properties of Nanographite Reinforced Chlorobutyl Nanocomposites, International Conerence, ICNC 2013, 12th – 14th March 2013, MG University, Kottayam, Kerala, India. J. Saji, S. P. Mahapatra (Corresponding Author) and Ayush Khare, Relaxation Behavior of Multiwalled Carbon Nanotube Reinforced Silicon Elastomer Nanocomposites, International Conference on Advancements in Polymeric Materials, 1st -3rd March 2013, CIPET-Lucknow, India. S. K. Tiwari and S. P. Mahapatra (Corresponding Author), Relaxation Behavior of Chlorobutyl Elastomer Nanocomposites, International Conference on Advancements in Polymeric Materials, 1st -3rd March 2013, CIPET-Lucknow, India. J. Saji, S. P. Mahapatra (Corresponding Author), S. Agrawal, D. Sahu, Physical and Mechanical Properties of Multiwalled Carbon Nanotube Reinforced Silicon Elastomer Nanocomposites, International Conference, IMPC-2012, IL 132, Page: 120, 23-25 March 2012, MG University, Kottayam, Kerala, India. S. K. Tiwari and S. P. Mahapatra (Corresponding Author), Morphology and Visco-Elastic Properties of Chlorobutyl Elastomer Nanocomposites: Effect of Multiwalled Carbon Nanotube Loading, OP-10, Page 28, Fourth Conference on Recent Advances in Polymer Technology, 2-3 March, 2012, North Maharashtra University, Jalgaon, India. S. K. Tiwari and S. P. Mahapatra (Corresponding Author), Chlorobutyl Elastomer Nanocomposites as Effective Barrier Materials, NanoSciTech 2012, International Conference, OL, 16-18 Feb. 2012, Punjab University, Chandigarh, India. S. K. Tiwari, S. P. Mahapatra (Corresponding Author), B. Sahoo, S. K. Pandey, Physico-Mechanical Properties of Multiwalled Carbon Nanotube Reinforced Chlorobutyl Elastomer Nanocomposites, International Conference, APM-2012, OP, Page 185, 10-12 Feb. 2012, CIPET, Ahmedabad, India. S. P. Mahapatra (Corresponding Author), S. Agrawal, D. K. Tripathy and S. K. Pandey, Temperature Dependent Dielectric Properties of Microcellular Rubber Composites, OP-A1, International Conference on FUCTIONAL POLYMERS, Page 29, Jan 28-30, 2011, NIT CALICUT, Kerala, India. S. K. Tiwary, S. P. Mahapatra (Corresponding Author) and S. K. Pandey, Electrical Conductivity of Multiwalled Nanotube Reinforced Butyl Elastomer Nanocomposites, International Conference, ICNC – 2011, 7th – 9th January 2011, IMSE-MG Univ., Kottayam, Kerala, India. S. P. Mahapatra (Corresponding Author), D. K. Tripathy and S. K. Pandey, Electrical Properties of Microcellular EPDM vulcanizates: Effect of Conductive Carbon Black and Blowing Agent, International Conference, ICPPC – 2010, page 181, 15th – 17th January 2010, IMSE – MG Univ., Kottayam, Kerala, India. S. P. Mahapatra (Corresponding Author), F. Khan, P. Chaudhary, V. Sridhar and D. K. Tripathy, Dielectric Relaxation Properties of Butyl Elastomer Nano Composites, International Conference, PolymCon - 09, OP-4.2, Page 148-167, 9th – 11th January 2009, NIT, Calicut, Kerala, India. S. P. Mahapatra, V. Sridhar, J. K. Kim and H. Kwak, Dynamic Mechanical and Dielectric Relaxation Characteristics of Microcellular Rubber Composites, 19th Korea International Plastic and Rubber Show, B4, pp 117-122, Coplas-2008, 28th March 2008, KINTEX, SEOUL, South Korea. S. P. Mahapatra and D. K. Tripathy, Studies on Microcellular EPDM Vulcanizates: Effect of AC Conductivity and Positive Temperature Coefficient, India International Rubber Conference and Expo-2007, Paper 1D, 1-6, IRI, Hasetri, Rajasthan, India. 1. 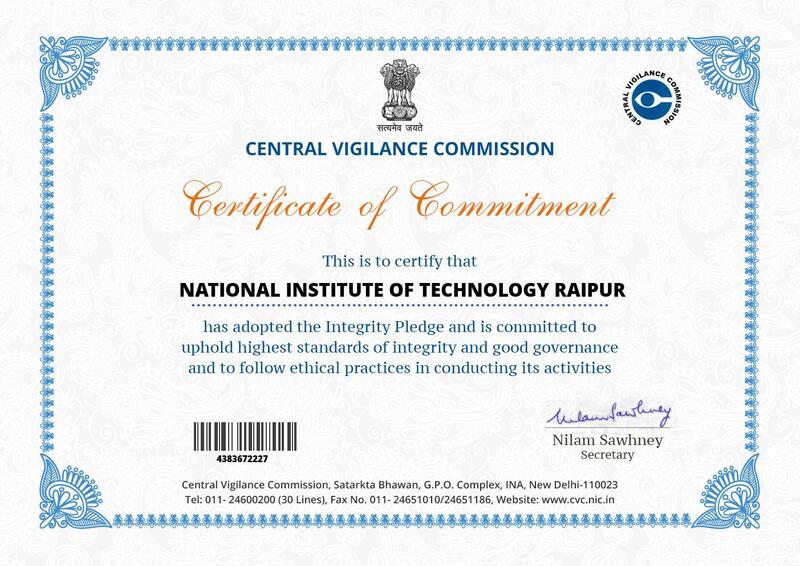 Joined NIT Raipur in 2008. 2. Research Award Recepient Fellow (2007), University of Ontario Institute of Technology, Oshawa, Canada. 3. Post Doctoral Fellow (2007-2008), Chung-Ang University, Seoul, South Korea. 4. Supervision: Ph. D.: 02, M. Tech. : 01, B. Tech. : 19. 5. 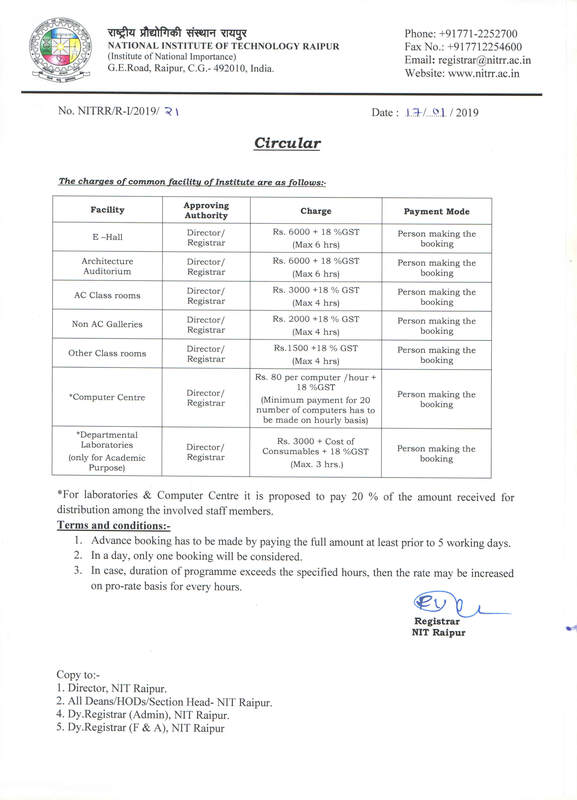 Sponsored Project Undertaken: Preparation and Characterization of Microcellular Elastomer Nanocomposites for Packaging and Semi-conducting Applications, CCost, Raipur, CG. 6. Faculty In Charge Security 2013-2015. 7. Faculty In Charge NCC 2008-2014. 8. Assistant Examination Superintendent Since 2010. 9. Verification Officer, CCB, CSAB and JoSAA Since 2010. 10. Member, Departmental Academic Committee, DRC & other Departmental Committees, Department of Chemistry. 11. Member, DGC, Department of Chemistry, Department of Physics and Department of Mettallurgical Engineering. 12. External Member, Purchase Committee, Department of Physics & Department of Chemical Engineering. 13. Member, Cultural Committee NIT Raipur.